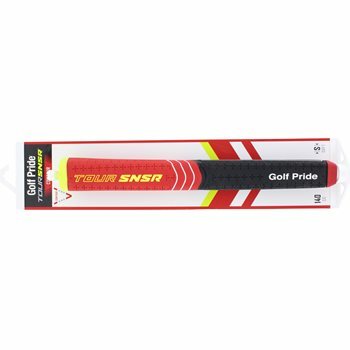 The Golf Pride Tour SNSR Contour putter grip has a pistol contour shape. The exclusive SNSR compound and textured design delivers Tour preferred traction, a heightened feel and moisture control. The wide, paddle front is designed for proper thumb placement and face alignment while the pistol contour provides larger geometry in upper hand that helps lock-in grip for repeatable motion and a solid contact. The Contour putter grip promotes improved distance control and lighter grip pressure for more fluid strokes.